Cicero may have been typical of Lake Street stations constructed in 1892 for the Lake Street Elevated Railroad by its engineering staff. These iron structures were executed in the Queen Anne style with some Victorian Gothic style features and originally had chimneys. The pressed metal structure contained some decorative detail, mostly around the windows. These stations also originally had elaborate railings on the platforms. Two examples can still be seen at Ashland (in use) and Homan (abandoned). However, as early as 1941, Cicero had an island platform not dual side ones like the aforementioned Lake Street stations, so it may also have been of a totally unique design. At some point, the original station was replaced with a new structure. 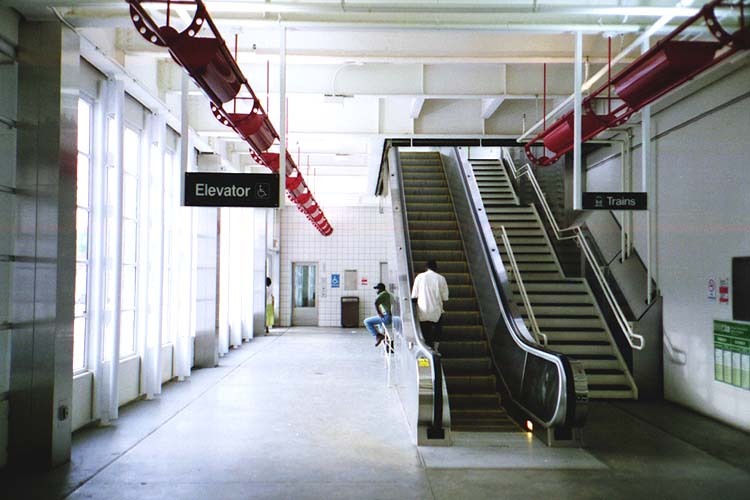 Stairs from the street led to a mezzanine fare control area above the street and from there, stairs led to an island platform. By the early 1960s, the Cicero station was an island platform with fare collection at platform level. There was a station house constructed on the platform, with light-colored exterior walls with three windows on each side (or, at least on the north elevation...) and a peaked roof that continued east of the station house to become the platform canopy. It was fairly clean with no peeling paint or broken boards and with the Brach's candy factory a few blocks away, it was always a very busy station at rush hour. There were a set of stairs to access the station on each side of Lake Street as well as on the east side of Cicero. These stairs were connected by a mezzanine walkway above the street (which also allowed pedestrians to cross the street without dealing with traffic). At the center of this mezzanine platform was another set of stars that would lead up to the fare collection area and station platform. As is still the case today, the platform was only partially covered with a canopy and during rush hour when the trains stopped further down the platform, riders were out in the open. When the Lake Street Line was closed in 1994 for refurbishment with the rest of the Green Line, the rehabilitation scheme included new plans for the Cicero station. In a commendable step, the CTA built a considerable two story station with interior retail space. The station is attractive and is also handicap accessible. Passengers enter from the ground floor and go up escalators or elevators to the second story where the fare controls are located. From there, an elevated passageway leads to the island platform. Unfortunately, the sparkling new station stands as a beacon in a neighborhood still suffering from economic disinvestment, even several years after the station's opening. 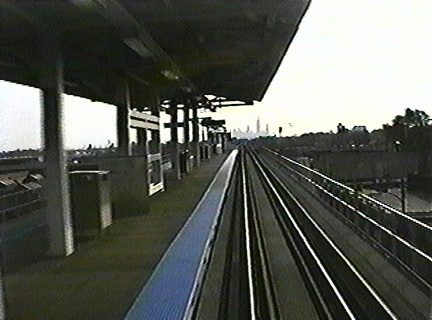 The two commercial spaces were still empty as of July, 1998. Hopefully, the CTA's effort will yet pay off. 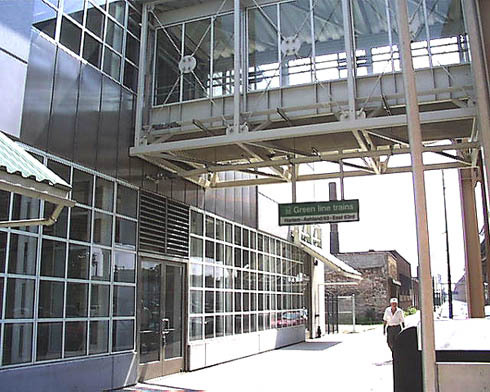 Like many of the new Green Line stations, the new Cicero station was not ready for use when the line reopened on May 12, 1996. The station opened with the new island platform in use and access from the street via the auxiliary exit from Kilpatrick Avenue at the east end of the station with a temporary ticket agent's booth for fare control. The permanent, accessible two-story station house didn't come into use until more than a year later on Sunday, June 22, 1997 at 0530 hours. 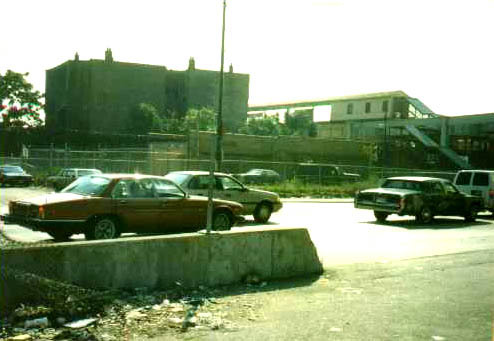 At that time, the temporary entrance at Kilpatrick was converted to exit-only. 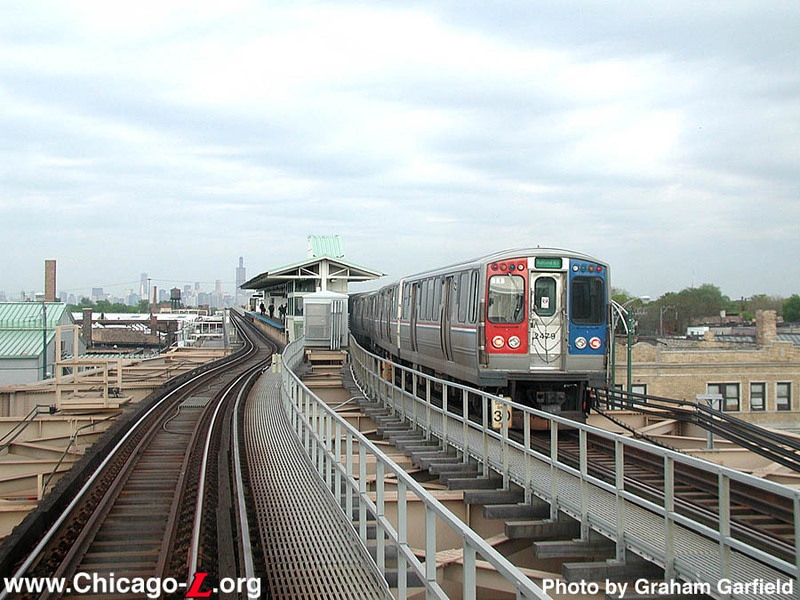 In September 2004, Dunkin' Donuts, the coffee and baked goods chain, opened five new concessions in CTA stations around the "L" system. One such new concession was located at Cicero/Lake station. "This is the first major concerted effort to open a significant number of Dunkin' Donuts stores in CTA stations," said Mike Lavigne, director of development for Dunkin' Donuts. All new Dunkin' Donuts /CTA station stores were scheduled to be full-service. 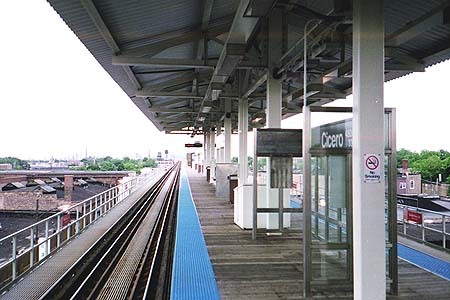 During Autumn 2004 and Spring 2005, several "L" stations got new station name signs. As part of a multi-station program, twelve facilities in all on the Blue, Purple, Red, Orange, and Green lines received new, Current Graphic Standard station name signs, replacing older KDR-type signs that used an outdated graphic scheme that was inconsistent with the colored line names. The new signs not only replaced old ones in existing locations at these island platform stations, but were added at additional locations outside the tracks, facing to the platform, for ADA compliance. The new additional signs outside the tracks were mounted on new steel brackets that are supported and project from below. Installation at all stations was complete by the end of November 2004 except at Cicero and Central on the Green Line, whose signs were completed in early 2005. Fabrication and installation of the signs was performed by contractor Western Remac.